“Wa Lone and Kyaw Soe Oo symbolize their country’s emergence after decades of isolation,” said Wojciech Tochman, President of the Jury. “Both from modest, provincial backgrounds, they worked hard to pursue careers that would have been impossible in the junta era into which they were born. They were arrested because they documented a taboo topic regarding crimes committed against Rohingyas. 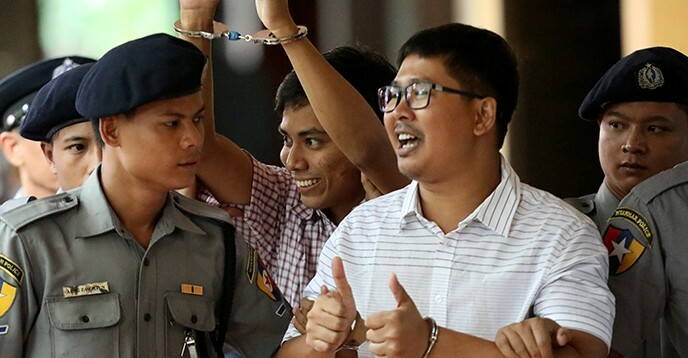 The final choice of Wa Lone and Kyaw Soe Oo pays a tribute to their courage, resistance and commitment to freedom of expression,” he added. The Prize recognizes outstanding contributions to the defence or promotion of press freedom especially in the face of danger. It is named after Guillermo Cano Isaza, the Colombian journalist who was assassinated in front of the offices of his newspaper El Espectador in Bogotá, Colombia, on 17 December 1986.